It is the first part of this quote that caught my attention. Lagerfeld certainly has a way with dressing bodies; I am not so sure about his ability to build bodies using only fashion. But I certainly agree with the first part of this quote: the brain is a muscle and as such needs to be trained, shaped, and nurtured. My brain is without doubt the most important part of my body—this is what I conclude whenever I have those unfortunate yet unavoidable moments of visualizing potential catastrophes. The ability to think, manipulate material, information and challenges is one, if not the one, of our most powerful tools. You don't need to be a genius to feel good about your thinking; it is not that I feel smart or smarter than others. It is my desire to think and solve problems that exalts my brain over other realms of my body. And yet, we still need to be productive. It is the combination of thinking and doing that makes the impact. It is the balance that matters. Overthinking can result in doing nothing; overdoing can result in futile productivity. It is the brain that stimulates emotions and functionality but also creativity and aspirations, dreams and motivation. Being smart is an expression of self-perception. Sure, there are quantitative measures we have developed for the purpose of comparison. But it is what nature has endowed us with that is our starting point. From here, we can stretch our minds and by being conscious, working hard, facing challenges and being determined, we can each reach at least our potential. We are taught, especially as women, to behave well, be polite and good, and to take care of our appearance. If we are lucky enough, we will also be taught how to take care of our bodies, to be in shape, and to make conscious nutrition choices. If we are luckier still, then we are taught about the importance of knowledge and education and exceling in our studies. But no one really teaches us to train our minds. There is a profound difference between studying or acquiring knowledge and training our mind to understand, think independently, welcome challenges, encourage curiosity, foresee obstacles, evaluate situations, stimulate critical thinking, and shape and encourage resilience by encountering new adventures. No one teaches us to connect our thinking abilities with inside evaluation of our unique qualities. That is something we occasionally learn by firsthand life experiences when there is no one mediating or mitigating the results. We have a brain and we have to use it to its maximum potential. Apply it, train it, encourage and support it. It has been scientifically proven that the brain, like every other organ, is constantly changing. Its structure, as well as its functionality, changes in response to outside stimuli but also in response to positive thinking or meditation. In the post Rewire our Brain I recommend a few related books for further reading on this subject. As someone who was always fascinated with high thinking and who aimed at developing a Corporate America professional career, I was confused by my other attraction to beauty, aesthetics and harmony. This confusion created a dichotomy between the stimulations of my inner being versus my outer being. The collision between what was perceived as meaningful internal reflections of values on the one hand and "insubstantial" external expressions such as beauty, fashion and style on the other, represented another change I was about to undergo. I was caught between my mixed feelings toward overconsumption and my need for "intoxicating release" as beautifully said by Diana Vreeland: "Fashion must be the most intoxicating release from the banality of the world." It was while Looking for Meaning that I realized there doesn’t have to be any contradiction between the two. They are both means of personal expression. Beauty, in its regular conceived form (natural beauty, some would say), is important, whether we like it or not. Interpretations of the definition of beauty are constantly in flux, influenced by society's ways of contemplating its exaggerated impact by subtlety suggesting that "beauty is in the eye of the beholder" or that brain outweighs beauty. To me, it is not a question of which is more important. For me, the ruling definition of beauty is that it is a reflection of your thinking which is expressed externally by the way you dress, design or decorate. It is the outer expression backed by inner meaning that makes the impact and stimulates influence and inspiration. 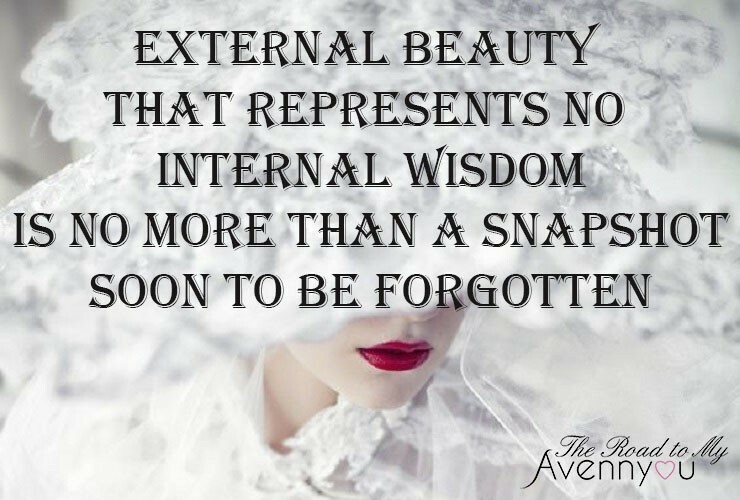 External beauty that represents no internal wisdom is no more than a snapshot soon to be forgotten. Becoming a savvy fashionista, for example, is a result of having exceptional taste and a unique style. It requires keeping up to date with the latest fashion news while not falling victim to every new fad. It is the ability to express your personality in the way you dress or reflect your talent in your stylish appearance that makes the impression. Thus, for me, brain and beauty are no longer paradoxical concepts. They are two more elements that shape my journey and which, most likely, shape the lives of many other women; some choose to side with one over the other, others do so from lack of choice. I hope that by pursuing my passion for both of these, as well as many other elements, I will ensure a life that best matches my goals, aspirations and capabilities.